SAN ANTONIO --Officials in San Antonio were investigating video that apparently shows a school district police officer body-slamming a middle school student to the ground. 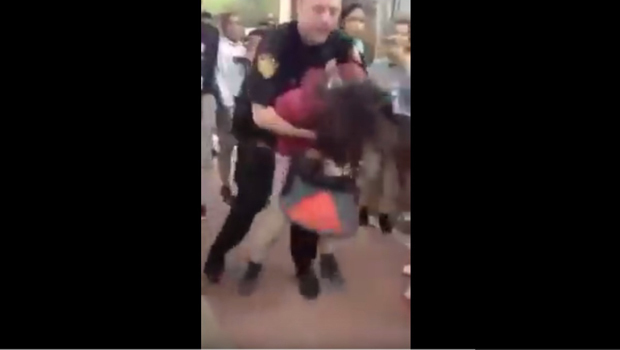 In the video, a uniformed officer is seen struggling with a girl, then slamming her to the ground. The officer appears to handcuff the girl before having her stand and leading her away. Gloria Valdez, the 12-year-old girl's mother, told CBS affiliate KENS it was completely uncalled for. "Supposedly he was threatened by her that she kicked him, but in the video her legs never went up," Valdez said. Valdez's daughter did not want to go on camera but told KENS that she was having a conversation with another girl when a crowd surrounded them. She said that's when the officer put his hands on her. "All he had to is grab her and put her to the side," Valdez said. A spokeswoman for the San Antonio Independent School District said the officer has been placed on paid leave. Leslie Price told the San Antonio Express-News that the video posted online shows part of a verbal confrontation between two students at Rhodes Middle School on March 29. The district did not identify the officer or the student. The person who posted the video said the officer was Joshua Kehm. "This video is very concerning, and we are working to get all of the details," Price told the newspaper. "We certainly want to understand what all occurred, and we are not going to tolerate excessive force in our district." Valdez said the force was so powerful it knocked her daughter out. "She was, I guess, unconscious. She doesn't remember being arrested with handcuffs," Valdez noted. "[She's] bruised because of how she was hit on the cement." "I just want justice for my daughter," Valdez said. "How do we know this officer won't do it again to another student."